Welcome November!! This means I have just over two months of pregnancy left!! Woo Hoo!!!! I was pleased with what my crazy hormones let me achieve this month. 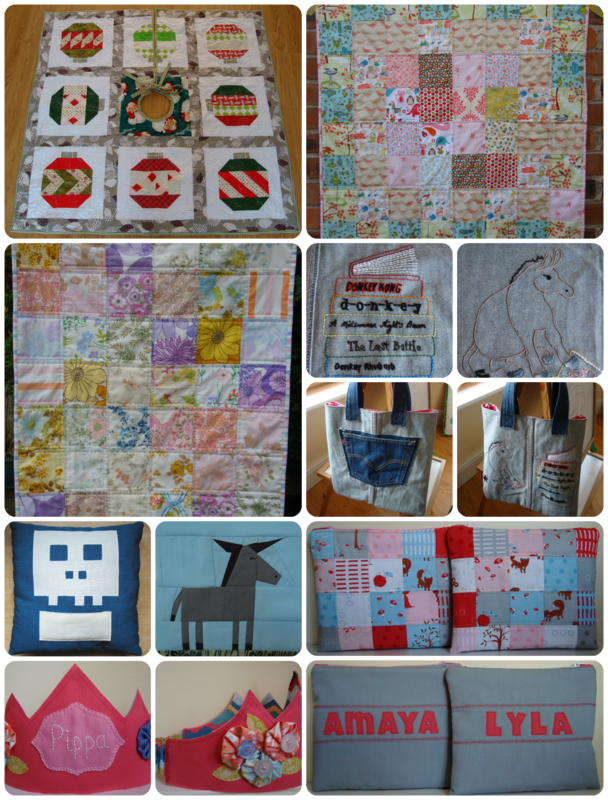 It was exciting to be part of Donktober at Missy Mac Creations and make some fun Donkey themed projects, I also got two quilts and a tree skirt finished as well as other little makes. I have tons left I want to do before the baby arrives but I'm just sewing for pure pleasure and making whatever takes my fancy, it feels awesome! I also made a pincushion for the incredible Emily. 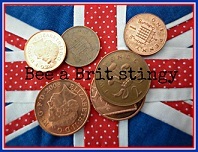 We had a little swap as part of Bee a Brit Stingy, which doesn't officially start until January. I also received my gorgeous pincushion from the talented Janet. Actually I got two!! One is lovely and bright, made from the softest fabric and the other has been beautifully embroidered. Thank you so much Janet, they are both fabulous. The macaroon was quickly devoured by my Scottish husband when I wasn't looking but it was a great reminder of home and childhood for him so I couldn't be too mad! Such fantastic stitching!! This is a really handy size too and I've been carrying it around while I EPP. I had another couple of nice Bee treats in the post, this time as part of Scrappy? Sew Bee It! It's my turn as queen bee and I requested AMH feathers. Here's the lovely rainbow one from Annika and a great siggy block too! Thank you Annika! Thank you so much Carla, that little feather is just too cute! Finally I was SUPER DUPER excited to see my Winterkist challenge projects featured in Fat Quarterly Issue 11, the Christmas edition. Go get yours to see all the fabulous Christmas patterns and ideas! 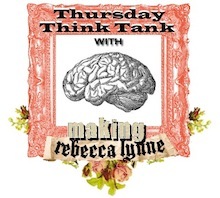 And if you've had any finishes this week make sure you come back tomorrow to link up and join the party, I'm hosting TGIFF! I LOVE your AMH Feathers! I am going to make myself a whole quilt from those soon! 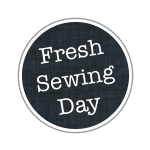 My day for the Sew Seasonal is Saturday! You made wonderful things last month!! I'm also working on those feathers, they are great aren't they! I love your Lil' Matryoshka pin cushion - it is adorable and a little bit tough at the same time. What a fabulous collection for this month. Lots of lovelies for October!! Love your little pincushion - very sweet! The feather blocks are looking so fab - what a great quilt that's going to be! I think you should have babies every year you are just so productive! Heehee! Or maybe not! Emily must adore her pinny - you should be selfish more often! I love my Rosestar block and I need a kick in the pants to get on and make yours and another feather block - lazy person that I am! Wow, you got so much accomplished (and while pregnant!!! you deserve a medal!). I love the matryoshka doll. Just so cute! Well done, so good to hear that you are getting a chance to sew just for the fun of it - sometimes those moments seem rare. So you'll be spending new year with a new baby? wow...you've got alot of beauties done last month, Lucy! Oh MY GOSH!!!!! You are on a roll or nesting either one...amazing! So many beautiful things!! I love that tree skirt!!! SO MANY things!!! I have my Fat Quarterly just because you are in it (I am serious, I never bought it before!). Glad you are hosting TGIFF tomorrow! Love all the things you have made especially the gnome garland. I wish some of your sewing hormones could rub off on me. I am half way now and haven't seen anything in ages! I think we're all looking forward to meeting this baby!! Your projects are all amazing. Love the little Gnome garland, and the feathers your bee is making are super awesome. The feather blocks are lovely, and I really like the matryoshka pinnie! I love everything in this post, particularly the pin cushions and the feathers! wow, how do you find the time to be so busy!! So many beautiful projects - love your EPP and the feathers! What??? You've got to fill me in on the Matryoshka pattern. Hello 3 girls! I must do it for our new house! There are so many good things in this post. It is hard to believe you are making a baby given all this work, you must be in that hyper nesting stage. I love it all. And I have a bee block to pick, I might just take a closer look at those feathers.